...are you ready to play? MAC - from the Yard Dogs to St. Patricks Day! Accordionist Buddy Connolly will play a benefit concert on March 16, just north of Washington, D.C. where you can hear Buddy's amazing talents woven into the "Celtic Rock" of these Nashville musicians. Featured in the January Edition of Billboard Magazine, Ceili Rain is causing folks to dance jigs and reels on radio stations across the country. Don't miss this opportunity to see Buddy Connolly with Ceili Rain in an intimate, up close setting. The concert will be held at 7:30 PM at the St. Rose of Lima Parish, 11701 Clopper Road, Gaithersburg, MD. Admission price is $17.00 Adults & $12.00 Students at the door. Rita Davidson (pictured here performing with orchestra at the United Nations in New York) will present a workshop-concert "Developing an Advance Music Repertoire" at the TAA Festival in Plano, Texas March 9 at 1:30 PM in the Plano Holiday Inn. She will incorporate the works of Eugene Ettore, a significant contributor to the accordion repertoire. 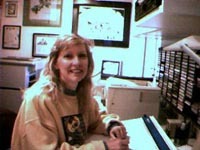 Rita has been using the accordion in her job as vocal music teacher in West Orange, NJ for over 20 years. She is a graduate of the University of Connecticut. She is on the board of directors of the ATA of NJ and adjudicates competition and evaluation catagories. She has presented the " Music of Eugene Ettore" most recently at the AAA Festival in Washington, DC this past July. She also played in New York at the AAA Workshop and Concert run by William Schimmel where she also presented "Waltz for Accordion and Strings" by the New Zealand composer and conductor of the Auckland Symphony orchestra, Gary Daverne. More recently, she gave a workshop-concert at the AAMS Festival in King of Prussia, PA.
Rita's cassette of the works of Eugene Ettore is available by contacting her at Ritabelll@aol.com. In addition, anyone who is interested in obtaining his music can contact her directly. Rita is also available for workshops, judging, and concerts. Henry Doktorski will perform at the City University of New York on Friday, March 23rd, 2001. The recital, sponsored by The Center for the Study of Free-Reed Instruments and The John D. Calandra Italian American Institute, will begin at 7:30 P.M. at the Baisley Powell Elebash Recital Hall at The Graduate Center, CUNY, 365 Fifth Avenue at 34th Street. Doktorski will perform compositions by two great Italian-American accordionists of the first half of the 20th century: Guido Deiro and Pietro Frosini. Guido Deiro was born in Salta, Italy in 1886; as a young man he played at beer gardens and cafes in Italy and Germany. After he emigrated to the United States shortly after the turn of the century, he became famous as a vaudeville star, international recording artist, composer and teacher. 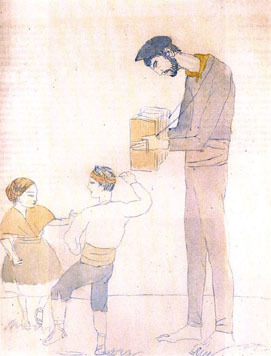 He and his brother Pietro were among the highest paid performers on the circuit. He began teaching when the "moving pictures" forced many vaudeville shows to close. Guido dated the famous actress Mae West and is mentioned in her biography. He died in 1950. Pietro Frosini was born in Catania, Sicily, in 1885 and began to play the accordion at the age of six. In 1905 he emigrated to San Francisco and was discovered by a talent scout for the Orpheum Vaudeville Circuit. Soon after, he met and became friends with Guido Deiro. Frosini made one of the first accordion recordings on a cylinder record for Edison in 1907 and made his first Victor recording in 1908. He traveled extensively on the vaudeville circuit in America and abroad and even performed for the King of England. Frosini gave up vaudeville in 1932 when the "talkies" closed most vaudeville companies; he then became a staff accordionist for WOR radio in New York, a position he held until his death in 1951. Throughout his career, he performed, taught, composed and arranged music for the accordion. He wrote more than 200 original compositions for the instrument. During the CUNY recital, Doktorski will perform two works by Guido Deiro: the waltz My Florence (1918) and the fantasia Egypto (1923), and four pieces by Frosini: the swing novelty Rag in D Minor (1916), the waltz Florette (1934), the overture Omaggio a Pietro (1918), and Rhapsody No. 2 in C Minor (1939). The recital is part of a larger event sponsored by CSFRI titled The Accordion as an Icon of Italian American Culture. This two-part event begins on March 23rd with a symposium at 3 P.M. (in which scholars will present papers examining aspects of the accordion and Italian American culture), and concludes with the accordion recital at 7:30 P.M. Other performers include Robert Y. McMahan and William Schimmel. Canadian accordionist Joseph Petric's landmark recording of the Peter Paul Koprowski Accordion Concerto with The Toronto Symphony Orchestra under Jukka Pekka Saraste, has just been released on the Canadian Broadcasting Corporation's (CBC) SM 5000 label. The Koprowski concerto is notable in the accordion repertoire for its audience impact and is the most significant concerto recording for accordion since the release of Arne Nordheim's concerto SPUR nearly twenty years ago. The concerto was written in 1993 after a commission from Joseph Petric and the CBC. After its premiere with the CBC Vancouver Chamber Orchestra in 1994, Petric gave seven performances of the Concerto with numerous Canadian orchestras including the Toronto Symphony Orchestra. Peter Paul Koprowski (b.1947) is one of the internationally best-known Canadian composers. According to Koprowski, his musical aesthetic, "is in the tradition of composers who have been concerned with a 'summing up.' I am less interested in contributing to the development of the language than I am in contributing to how the language is used." 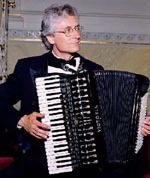 Joseph Petric is the only accordionist to have reconciled the accordion to the modern concert stage in a broad international public context. His performances have been described by the international press as "sensational...arcane...miraculous musical moments". The London Independent concurred by noting, "Had he been a pianist he would have won the Leeds Competition years ago". Other recordings by Petric can be heard on the ConAccord, Trappist, Zorro, Centrediscs, Analekta, Chandos, Imprinte Digitale, and CBC's Musica Viva labels. His recent release of Padre Antonio Soler - Nine Sonatas was noted in the Contemporary Free Reed for it's "flowing imaginative and authoritative performances". 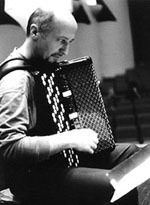 In December of 2000 he recorded the Berio Accordion Sequenza for Naxos. Analekta of Montreal will release his first Bach album in 2001. For a complete discography as well as other information about Joseph Petric, please visit his website at www.interlog.com/~jpetric. The Will Holshouser Trio comprises Ron Horton, Trumpet, Dave Phillips, Bass and Will on accordion. Will began playing the piano at the age of 9, with a strong interest in Jazz. It was when a friend offered him an old accordion that he became infatuated with the sound and so began his accordion career. Will went on to study accordion with well known New York accordionist William Schimmel for five years. Will and his trio are featured regularly at the Knitting Factory, The Cutting Room and Tonic in New York where they play styles as varied as rock, jazz and Klezmer music. 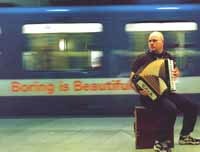 Will's music 'successfully showcased the range and beauty of the accordion...this could be music for some fantastical Fellini Film." 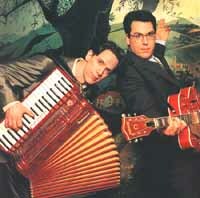 "Will Holshouser plays as much accordion as there is to be played." The UMKC Accordion Orchestra under the direction of Joan Cochran Sommers has announced its exciting program for the 40th Anniversary Concert to be held April 29th, 2001. This landmark concert will also mark the retirement of Joan Sommers from the Conservatory, and while the orchestra will of course continue, it will be the last official concert of the orchestra during the accordion program at UMKC. In conjunction with the concert, the UMKC Accordion Orchestra will release a set of four CD's highlighting the 40 years of accordion greatness. The concert will be at 2:30, Sunday April 29th, and everyone is invited to come and share in this truly momentous occasion. For details, please contact Joan Sommers at: SommersJ@umkc.edu or call 816 235 2700 for ticket information. The Accordion Club of the Redwoods will celebrate its fifth year anniversary in March. They will celebrate this occasion in May so as to coincide with the installment of the new board. The Accordion Club of the Redwoods meets every third Monday of the month at the Hermann Sons Hall, 860 Western, Petaluma, CA. Meetings begin at 7:30 PM, and meetings are open to the public, especially visiting accordionists and anyone else interested in the accordion. There is a $2.00 admission donation. The Milwaukee Accordion Club recently featured the Louisiana Yard Dogs, where they invited guests to chase their winter blues right out into the swamp! 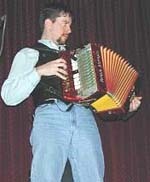 The leader, Charlie Kuchler, who performs on a wireless Baldoni Midi accordion performed with sidekick Jim Tillman on guitar and vocals. Charlie finds the wireless Midi works well, as he proclaims that a strolling accordionist, a moving target, is harder to hit when over-enthusiastic party participants want to throw mysterious objects at him! This month the MAC will feature club member Rob O'Steinhofer as he gathers a group of musicians to play Irish Music in celebration of St. Patricks day. For full details, visit the MAC site. Californian based accordionist Liz Finch has been working in the Los Angeles area entertainment industry for almost 25 years serving either as a copyist, orchestrator, or arranger for record albums, television programs, commeracial ads, live performances, and movies. One of her most recent jobs was working as an orchestrator for the current box office hit, Hannibal. "In this case, we were asked by the composer, Hans Zimmer, to use 28 cellos, and 12 string basses, voices, and percussion instead of the conventional orchestral setup on many of the cues that you hear in the underscore. (That means no brass, woodwinds, violins or violas!) The idea was to lend a different timbre to enhance the eerie scenes. This presented a challenge because Hans used the entire range normally attributed to a conventional set up in his compositions." The score was recorded by musicians in London who did a remarkable job in playing the exaggerated 'highs and lows'. Some of the other cues did use a conventional orchestral setting, such as in the opera scenes." Liz even re-orchestrated a Frank Zappa tune for a live concert that was presented in Belgium last fall and soon Liz will begin working on the film "Pearl Harbor", with music also composed by Hans Zimmer. "Sometimes you will see my name in the credits, sometimes not - I never know. I often work with a "team" of orchestrators and we don't always get screen credit. We do get paid, however!" Liz, is a former student of Joan Sommers, and has toured with the UMKC Accordion Orchestra on many of their tours for which she always does special arrangements. Recently, Liz served on the jury of the Confederation Internationale des Accordeonistes Coupe Mondiale, World Accordion Championships - CIA. Vocalist Raquel Bitton will sing "A little bit of Paris" at Carnegie Hall on March 30th accompanied by accordionist Dominic Cortese and a 20 Piece orchestra. Their program will include songs from the romantic Parisian era of the 1920's,1930's and 1940's by Edith Piaf, Charles Trenet, Paul Misraki, Jean Sablon Lucienne Boyer and others. Sharon Shannon, widely regarded as one of the most gifted musicians of her generation, was born in the Village of Ruan near Corrofin in Clare County, Ireland. She is one of the most adventurous musical spirits to emerge from Ireland in the past ten years. The young accordion player has made a huge impact on the traditional music scene, boldly crossing musical borders with humor and flair. Her parents IJ and Mary were set dancers and the four children all play music: Sharon accordion and fiddle, Mary (Bumblebees) banjo, Majella fiddle and Garry, flute player with the Kilfenora Ceili Band. Sharon started like so many on the tin whistle, but by ten she was playing the accordion. She also plays the fiddle and melodeon. Over the past decade, Sharon has collaborated with some of the finest musicians around the world. In the late 1980s, she played in the Irish act Arcady, with singer Frances Black and bodhran player Johnny McDonagh. She has since worked with such prominent artists as Donal Lunny, Natalie Macmaster, Dennis Bovell, Adam Clayton of U2, and Liam O’Maonlai of the Hothouse Flowers. Sharon’s debut album, Sharon Shannon (1991), was immediately celebrated as a critical marker in Irish folk history. Infectious and bright, imbued with the native culture but also aware of global possibilities, the album gave Sharon a rising popularity across the festival circuit. Her shows on the acoustic stage at the major English festival of Glastonbury were fervent testimonies to the power of a two-row Castignari button accordion in full effect. In 1992, she was included on the record A Woman’s Heart, which celebrated Ireland’s female performers. This became the island’s biggest-selling album, and Sharon’s subsequent tours were warmly received. Her latest recording, Spellbound - The Best of Sharon Shannon, continues her rhythmic explorations while at the same time remaining faithful to the music's roots. It was produced by Donal Lunny, whose new group Coolfin often features Sharon as guest artist. Further collaborations with Lunny include playing on his score to the film This Is My Father, starring Aidan Quinn and James Caan. And her music was featured on The Brothers McMullen, which took the Sundance Film Festival by storm. The accordion she plays is a Castagnari "Tommy" in C#/D. She also plays a Castagnari in B/C. Why not advertise your web site on accordionusa.com? TELL THE USA WHAT YOU HAVE TO OFFER! The band has just inaugurated a $9.99 per month on-line music magazine called TMBG Unlimited, which includes new tracks in every issue. Their precursor to this, was a gimmick they initiated back in 1983, called Dial A Song, where callers could get a song played on their answermachine. Callers can still access this service, which currently includes accordion on the second track, by calling: (718) 387 6962. This advert was viewed in a popular computer magazine advertising Xpedio... Content Management from IntraNet Solutions. News, Concert, Club Listing, CD or Article! is a free service to the accordion community.